Upper leg pain is mostly very treatable with chiropractic help. Lower extremity conditions and numbness, are common complaints in the chiropractic clinic. There are many possible causes, so a careful examination is called for. This page was last updated by Dr Barrie Lewis on 13th November, 2018. ‘When did it start, Mr Jones?’ The man facing me is in his sixties, handsome and well dressed for a visit to the chiropractor in his Harris tweed and tartan scarf, but in fact Meralgia Paresthetica can occur in any age group. Meralgia paresthetica cause a numb patch which sometimes burns on the side of the thigh. 'Yes, he pulled my leg about a few times, and just said it wasn't arthritis. Could a blocked artery be causing it?' Mr Jones was starting to look alarmed. ‘A few awkward questions. You can urinate normally, and no difficulty getting an erection?’ No diabetes? 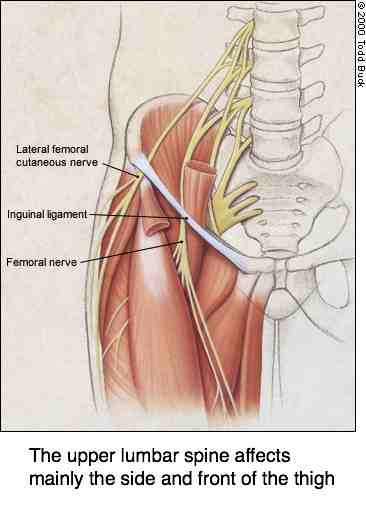 The Lateral Femoral Cutaneous Nerve (LFCN) originates in the low back (roots L2-3), runs down the Psoas muscle deep in the abdoman and through the groin on its way to the side of the thigh. It is a purely sensory nerve, so upper leg pain but not muscle weakness characterises this syndrome. On this journey it travels through a tunnel in the pelvis under a ligament in the groin where it attaches to a hard bump in the front of the pelvis pelvis (called the ASIS). 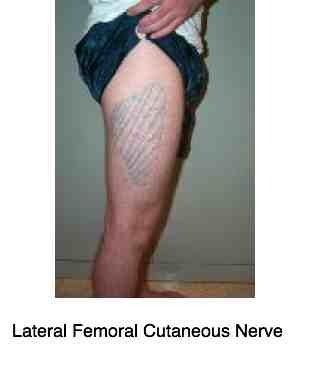 This is the most common site of entrapment of the nerve. Read more about MERALGIA PARESTHETICA. A little test, known as Nobles test is used to differentially diagnose an Ilio-Tibial Band Syndrome. (see lower down this page). For more about Nobles test and chiropractic help click here. If you are complaining of upper leg pain you can expect your chiropractor to do a very thorough examination. If she or he doesn't, go elsewhere. They will check the range of motion of your hip, and your lower back, all the muscles around the thigh and buttock, a full neurological and orthopaedic examination; and the pulses in the lower leg. In the groin itself they will be looking for the possibility of an inguinal hernia and swollen lymph nodes, and perhaps an aneurism. They will do two specific nerve stretch tests to check if the sciatic or femoral nerves are being pinched or irritated anywhere along their path. In the USA you may be expected to have a further series of tests to rule out the very rare things. A secondary cancer for example can gnaw away at the bone in your upper thigh. In the rest of the world however, if the diagnosis is fairly clear we often treat the condition and, only if it's not responding, order more tests. Only yesterday, for example, I was consulted by a man for the sixth visit, complaining of upper leg pain. Another DC had missed a very obvious arthritic hip. Working on the range of motion of the hip, deep muscle and capsule work in the groin, and a home exercise program, and he can now sleep through the night without pain. It's not rocket science, just a careful examination, and knowing how to manage such things. We haven't taken xrays. I know he has arthritis of the hip. However, I have recommended it should the progress not continue. Maigne's syndrome causes buttock pain and some authorities say it can affect the groin area. Lumbar and buttock pain coming from the thoraco-lumbar region, pain in upper leg, Maignes Syndrome, is a notoriously difficult region to adjust. Thus you should be patient with your doctor. You may not immediately hear loud clicks, and dramatic relief of pain. Common chiropractic adjustment techniques for this low back pain may include a prone straight bilateral transverse adjustment, a hyper extension technique (sitting or standing), a lumbar roll, McManis traction, an activator technique, and others. If you enjoy reading, the ramblings of this batty chiropractor will keep you chuckling all the way to your sweet dreams. 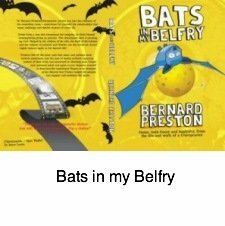 For more information about Bats in my Belfry, click here. Mr Jones responded quite well to my care of his upper leg pain, though it took nearly four months for the last vestiges of hyperesthesia - sensitivity to touch - in the thigh to recede. Within three weeks he could sleep though the night, and within a month he could walk well enough to take up hunting again. Shooting the pigeons and geese that caused havoc on the farmers’ lands in Holland was his passion. He even took a trip to Scotland to go shooting for grouse on the moors. Not my favourite passtime. Another short anecdote concerning pain in the upper leg (scroll down to 4-11-08) can be found at SHORT ANECDOTE. Although not in the usual sense a pinched spinal nerve syndrome, Mr Jones did have fixations in the mid lumbar region where the LFCN has its origin. Of course as a chiropractor I adjusted them, and cleared those subluxations first. Cross friction of a thigh muscle, and around the inguinal ligament in the groin was very painful but is an important part of the care of MP. He did exercises faithfully at home, and within a month we were both well pleased that the upper leg pain had subsided. Chiropractic care of Meralgia Paresthetica. Medical care as seen at this Meralgia Paresthetica information page. Restless legs is a poorly understood syndrome. In fact I think it covers a whole gamut of conditions. For example, Statins, the drugs used to lower blood cholesterol are known to cause restless legs. So too can a sacro-iliac syndrome, and hip conditions. True Restless legs syndrome is apparently a condition in the brain affecting the nerve supply to the legs. Some think that growing pains chiropractic are a variation of restless legs syndrome; in the chiropractic domain we think it's largely a feature of hypermobility, but behind it may be serious diseases such as Perthe's syndrome. Never ignore the limping child. Upper leg pain during PREGNANCY. Upper Leg pain often occurs during pregnancy and may continue long after the birth of your child. There are many causes from a frank slipped disc, but a common finding is pain in the vicinity of the pubic bones and groin, spreading down into the inner thigh. This is a readily treatable syndrome which lends itself to chiropractic care. Having said that, your chiropractor will have to do more than just adjust your back when you are suffering from leg pain during pregnancy. An essential part is working with the muscles in the inner thigh and groin if you are experiencing leg pain during pregnancy. The treatment is focused on an intimate part of the body, and you may want to take a family member with you for the first few consultations. Developmental hip dysplasia is a congenital, hereditary hip condition; untreated it progresses unerringly to full blown, early hip arthritis. Daily hip exercises to strengthen the core muscles is the key; upper leg pain is one of the symptoms. Whilst true hip dysplasia is relatively uncommon, mild doses of it are very common. Not having the sloping acetabulum, but nevertheless a shallow socket... hardly a day goes by when your chiropractor will not be confronted by the patient with groin pain, and it's not hip arthritis. Of course, arthritis in the hip is another cause of upper leg pain. When it's advanced it's a job for a good surgeon, but the trick is to catch it in it's early stages when flexion and adduction and internal rotation are becoming limited and sore, but before the arthritis is full blown. Start by simply pulling one knee and then the other to your chest. Does it feel limited, sore in the groin? For more information about hip arthritis, click here. I've kept the best for last. Sciatica is of course the most common cause of upper leg pain. Chiropractors treat hordes of people every day with lower back and leg pain that comes from a pinched nerve in the low back. There are several different causes which need to be considered. This is so common that we have several pages especially for this condition. Tip: You don't have to rush to the chiropractor with every little pain in the back, but when it starts going down your leg ... don't delay. Lower back and leg pain is serious. For more information about sciatica, lower back and leg pain ... click here. Children too suffer from upper leg pain. If your child complains of pain in the groin, and especially if they are limping, then please take him IMMEDIATELY to your chiropractor, and don't accept any talk of 'growing pains'. It doens't exist and a Perthes hip certainly does. This very serious malady, Perthes disease effects predominantly boys, but girls too, predominantly around 6-12. Treated promptly the serious sequelae can usually be avoided, but this is a very serious condition which, neglected, results in a nightmare of hip problems, often involving numerous hip replacements starting in the 30's, crutches by 50-odd and a wheelchair by 60. It took me many years to learn a basic: if a patient complains of lower or upper leg pain, particularly whilst walking or cycling, and has a negative Lasegue test, ONE SHOULD ALWAYS TEST THE PULSES IN THE ANKLE AND FOOT. Symptoms of aching legs at night time are discomfort, cramping, burning sensations and tingling feelings. Home remedies and natural cures for legs pain at night. Femoro acetabular impingement syndrome is another condition that undetected, and untreated, progressively turns to hip arthritis. Catch it early and there's much to be done; upper leg pain is a late finding of this silent disease. Not many folk recognise the hip stiffness as abnormal. When I studied chiropractic, in the last millennium, the term Femoro Acetabular Impingement Syndrome had not yet been coined, but I did notice periodically that young people can get the apparent stiffness of advanced arthritis in the hip. 'Twas a mystery for many years until I was exposed to FAIS as a cause of upper leg pain in a continuing education lecture by a prominent chiropractic radiologist. For more information about femoro acetabular impingement syndrome click here. It's very treatable with chiropractic help. Untreatable it progresses relentlessly to hip arthritis. Perhaps this summary of upper leg, thigh and groin pain will be of benefit. ILIOTIBIAL BAND STRETCH (ITB) syndrome. All chiropractors must attend continuing education courses. One of the best that I ever followed were the FICS online (sports chiropractic) courses. It was there that I learnt from Olympic Games chiropractors how a hip condition called ITB responds so well to chiropractic management. In Chiropractic Coalface you can read about a former marathon star, who hadn't been able to run for a whole year, was told that he must have a meniscus operation (which he duly did, with no relief whatsoever), but the cause of his upper leg pain was an Iliotibial band stretch syndrome. UPPER THIGH PAIN ... two case histories. Hippocrates certainly got it right. Good management of your cholesterol: CHOLESTEROL ALCOHOL ... Yes, for once the benefits! Don't throw dem CHICKEN BONES away. Great for healing worn cartilage in your joints.